Seats were sold out at the Historic Hoover Theatre in San Jose for the Flamenco Society “Juerga” featuring Flamenco students and teachers from the south bay. Providing an alternate genre of cultural dance, Sue and Yuki performed a variety of tangos to an enchanted and captivated audience. A delightful selection of music from the authentic and traditional sounds of tango by Francisco Canaro y su Orquesta to a modern milonga on Spanish guitar played by Craig Einhorn, and ending with a full orchestral vals by Russian composer Evgenyy Doga. 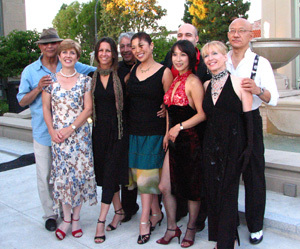 Jorge Torres, a world-renowned Tango Choreographer, Dancer, and Impresario of dance productions. He is amazing to behold on the dance floor, as he dances with a quiet and smooth style. His refined talents and style place him between those outstanding choreographers and dancers of Argentine Tango. 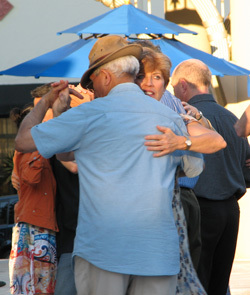 Tango Fantástico is proud to host Jorge Torres regularly when he visits the San Francisco Bay Area. Please visit www.jorgetorres.tangofantastico.com for more information.